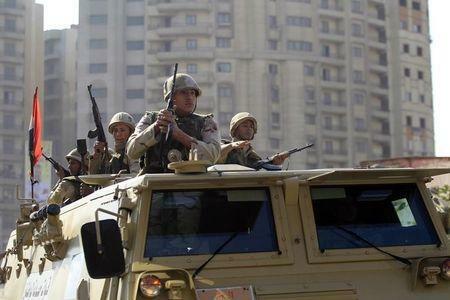 It was the first reported deployment of ground troops there by Egypt, which has one of the Arab world's strongest armies. A coalition led by Saudi Arabia has scored major gains against the militia and its allies in Yemen's army, backing a push by Yemeni fighters to seize much of the country's south and now setting its sights on the Houthi-controlled capital Sanaa. "We have sent these forces as part of Egypt's prominent role in this alliance ... the alliance fights for the sake of our brotherly Arab states, and the death of any Egyptian soldier would be an honour and considered martyrdom for the sake of innocent people," a senior Egyptian military source said. Brigadier General Ahmed al-Asseri, a spokesman for the coalition, told Reuters its forces were focusing on overcoming Houthi resistance in Yemen's central and southern provinces, pounding their positions from the air across the country before beginning any thrust towards Sanaa. "Before you start the ground operation, you have to have the prerequisite of the air campaign," al-Asseri said. "I don't want to talk about Sanaa because the military issue is in phases ... Now we are talking of Marib and Taiz."